Lithium (Li-ion) batteries are the technology that is revolutionizing energy storage systems, especially in solar photovoltaic installations, being the ideal alternative to conventional lead batteries. Maximum efficiency: Unlike lead-acid batteries, where the energy losses suffered during charging and discharging reach 25% to 30%, lithium batteries, the losses from charging and discharging are only 9%, which is up to 21% more energy usable from solar panels or another renewable source of energy. 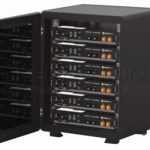 Healthy: Lithium batteries do not emit any kind of gas, not even residual, unlike the rest of batteries, even the AGM hermetic give off a little toxic steam. The Li-ion batteries are not, so they are ideal for installations with solar panels in houses. 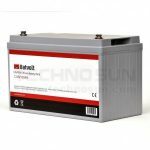 The general operating principle is the same as with lead acid batteries, requiring an anode and cathode to perform the electrochemical reaction, except that in li ion batteries the main element is lithium salts, a rare mineral. The first lithium accumulators began to be commercialized in 1990, but we did not begin to follow up until 1997, but its high price made it unviable for our market. It was in 2005 when we began to be able to propose its use at a commercial level, but it cost 1000€/kwh, nothing to do with the 300€/kwh to which we sell them today. Another interesting feature of lithium batteries are the discharge cycles, which determines their useful life. We have lithium batteries ranging from 3500 cycles as the Pylontech, to 10,000 cycles as the LG Chem RESU. When we compare lithium batteries with the equivalent batteries in lead acid, the OPzS, from the point of view of useful energy throughout their life, we see that lithium batteries are not more expensive. €/cycle. Lifetime: More than 3500 cycles, up to 10,000 cycles in LG Chem RESU batteries. Discharge Depth: Can be discharged up to 90% and still have more discharge cycles than 50% DoD lead acid. Self-discharge: The self-discharge in lithium batteries is very low, all batteries self-discharge, but Li-ion batteries self-discharge only 6% per month, while Ni-MH is more than 20% per month. Almost no memory effect: Forget about full cycles, use what you need. Higher energy density: Li-ion batteries have a much higher amount of energy per unit of weight and volume than the rest. LiFePO4: The technology of lithium ferro phosphate 4 is the safest of all, and recommended for homes, although with lower energy density than those used in electric vehicles. Both BYD and LG Chem use this technology.. Stable voltage: Lithium batteries keep the voltage stable until the end of their useful load, giving voltage stability to the inverters that allow them to work at maximum efficiency. BYD B-Box H: The use of BYD with SolaX voids the warranties, but it works. 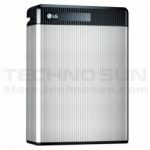 LG Chem RESU: 1 battery, regardless of size. 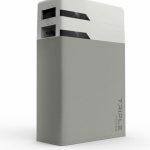 Pylontech 48V: Minimum 1 battery for the 3kw, 2 for the 5kw 8 for the 10kw Quattro and 12 for the 15kW Quattro. BYD B-Box H: 1 battery, regardless of capacity. 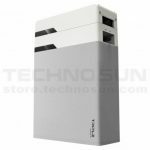 Pylontech 48V: US2000B or US3000B models, minimum 2 batteries. A full charge per month is recommended. 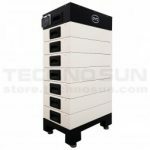 If the batteries are to be stored for a long time, it is advisable to do so at 40% of the charge, never at full charge. Heat is one of the greatest enemies of lithium batteries, the ideal temperature is 15 º C, keep out of direct sunlight. Lithium batteries have to be charged with specific chargers that allow to charge this technology. You can buy the lithium batteries that we distribute in Europe through your local solar installer or through our customers’ online stores.